Ambler’s best known works are probably The Mask of Dimitrios (1939) (published in the US under the title A Coffin for Dimitrios), which was made into a film in 1944, and The Light of Day (1962), filmed in 1964 as Topkapi. He was also a successful screenwriter and lived in Los Angeles in his later years. Amongst other classic movies based on his work are Journey into Fear (1943), starring Joseph Cotten, and an original screenplay, The October Man (1947). He wrote the screenplay for A Night to Remember about the sinking of the Titanic, along with many other screenplays, particularly those concerning stories and adventures at sea. 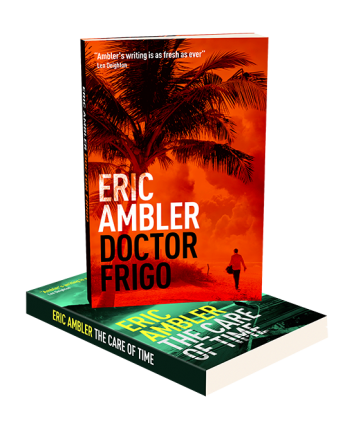 He published his autobiography in 1985, Here Lies Eric Ambler. A recurring theme in Ambler’s books is the amateur who finds himself unwillingly in the company of hardened criminals or spies: an ordinary person working under extraordinary circumstances. Typically, the protagonist is out of his depth and often seems for much of the book a bumbling anti-hero, yet eventually manages to surprise himself as well as the professionals by a decisive action that outwits his far more experienced opponents. This plot is used, for example, in Journey into Fear, Epitaph for a Spy, The Mask of Dimitrios, Passage of Arms, The Light of Day and Dirty Story. In Ambler’s books, unlike in most other spy novels, the protagonist is rarely a professional spy, or a policeman or counter-intelligence operative. A number of Ambler’s characters feature in more than one novel: Andreas Zaleshoff and his sister Tamara in Uncommon Danger and Cause for Alarm, Charles Latimer in The Mask of Dimitrios and The Intercom Conspiracy, Arthur Abdel Simpson in The Light of Day and Dirty Story, and Zia Haki appears as a Colonel Haki of the Turkish secret police in The Mask of Dimitrios and Journey Into Fear and is mentioned as a General Haki in The Light of Day.